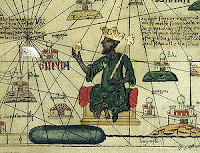 Laura Seay, Mali is Not a Stan, at Foreign Policy, argues that comparisons to Afghanistan (in addition to some fairly obvious topographical differences) misreads the situation; the French were invited in, know the country well, and are not plunging into a quagmire. Marc Lynch, at Foreign Policy's Middle East Channel, asked his readers, Is Mali Part of the Middle East? The conclusion is no, but certainly the events in Mali have resonances in the Maghreb, as the Algerian gas plant attack showed. My on approach on this blog is to be as inclusive as possible; when Mali affects events in North Africa, we can look at it, though that doesn't make it part of the Middle East. But historically, it is part of the greater trading area for North Africa (as the Indian Ocean is for the Gulf), and will occasionally demand attention. On more cultural issues, the African and Berber linguistics blogger Lameen Souag, at his Jabal al-Lughat blog, knows the territory well (one of his specialties is Songhay, the language group which includes the dominant language in Timbuktu). 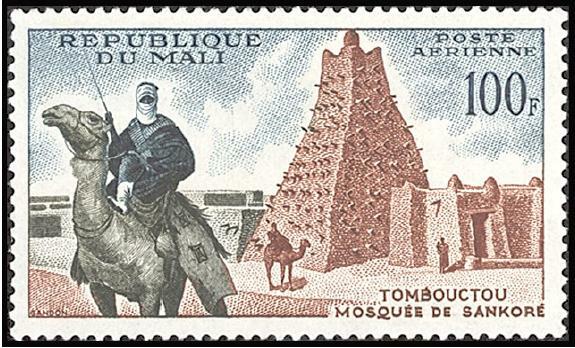 has two useful posts: "On Book-Burning in Timbuktu", and "Languages of Timbuktu," the latter of which seeks to clear up some confusion about the ethnicities and languages in the city. Via Jadaliyya, some good news on the question of the safety of the Timbuktu manuscripts. The South African partners in preserving the manuscripts are hearing they are indeed largely safe. Gamal al-Banna, who died yesterday at the age of 92, was the youngest brother of Hassan al-Banna, founder and first Supreme Guide of the Muslim Brotherhood. He did not share his brother's views, but advocated a flexible, modern interpretation of Islam and opposed the Muslim Brotherhood. 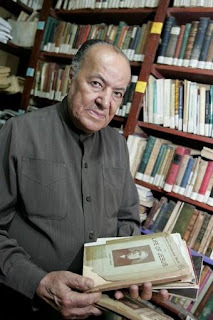 He questioned the traditional collections of hadith on which much Islamic law is based; he opposed the Brotherhood's advocacy of a Sharia-based state. A trade union activist as well, he evolved an anti-capitalist interpretation of Islam. Though long prominent in Egypt, he was discovered by Western media in recent years, who were fascinated that the Brotherhood's founder's own brother (though 14 years his junior) advocated such a different approach to Islam. Though he was in his 90s, the irony of his passing at this moment of crisis for the Muslim Brotherhood will doubtless be remarked upon. There are reports today suggesting that the vast majority of Timbuktu's ancient manuscripts may have survived (also here). These are much more encouraging reports than the initial fears of major losses; let's hope they're true. Today's Israeli airstrike along the Syrian-Lebanese border, if (as the leaks are saying) it was aimed at missiles being shipped to Hizbullah, raises a number of questions. Is Syria seeking to escalate in Lebanon as its own civil war goes badly? Is it seeking to provoke Israel as a distraction from its domestic issues? Whatever really lies behind the raid, it marks an escalation of tension in a region that is already highly unstable. If it remains merely a surgical strike that took out a specific threat, that's one thing. But any of the parties (Syria, Israel, Hizbullah) could use it as a pretext to escalate an already explosive situation. General Abdel Fattah Sisi', Egypt's so-far sphinxlike Defense Minister and Armed Forces Chief, has spoken. 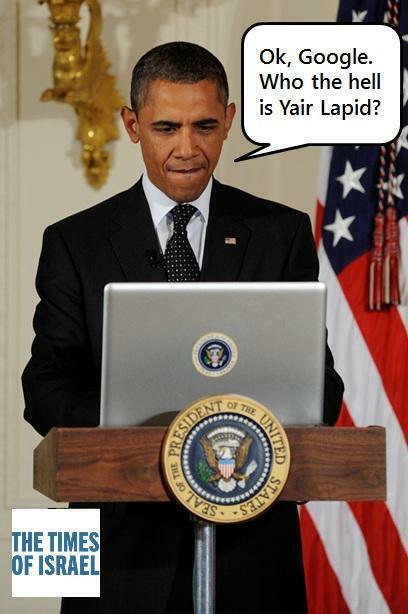 Well, not exactly spoken; he's posted on Facebook, but it's the best we're likely to get from him. He has warned that the growing conflict between President Morsi and his Islamist supporters and their secularist opponents "on running the affairs of the country may lead to the collapse of the state and threatens the future of the coming generations." "Collapse of the state?" Not exactly mild commentary from the man who controls the tanks. Delphic in a sense, but also stronger than anything we've heard from the Army since they retired to the barracks in August. Is this an explicit hint of a coup? Not yet. Is an implicit one? Well, duh. Over the past several days the deteriorating security situation has threatened two of Egypt's major sources of hard currency: the Suez Canal and tourism. The attack Monday night on the Intercontinental Semiramis Hotel saw some LE7 million (over a million US dollars) in damage to the hotel lobby and the looting of the elegant shops in the lobby; the hotel was evacuated as guests checked out not only there but from other hotels along the Nile Corniche. Egypt's tourist industry has been moribund; this may have taken it off life support. Of even greater concern is the virtual open revolt of the Suez Canal Cities. Beginning with the violence in Port Said over the verdicts in last year's football riot case, and fueled by demonstrations in the (often dissident) Suez, President Morsi ordered a State of Emergency in the Canal Governorates, and this included a curfew. Plate reads "Republic of Port Said"
Port Said, Ismailia and Suez responded to the curfew by turning out in huge protests, staging football games and other public events, and sending President Morsi a very big raised finger in response. The Canal cities have often been harbingers of change in Egypt (as Ismailia was in 1952 and Suez in 2011), and this collective revolt along Egypt's economic lifeline may have had more to do with Sisi's response/threat/hints than the Semiramis affair. The Army has moved the Second and Third Field Armies, based along the Canal, into position to protect the Canal and if necessary restore order in the cities. Morsi has shown signs of backing off a bit: pledging to create a mechanism to amend the controversial new constitution, and allowing the Canal Governors to reduce the curfew if they feel it is justified. A new outburst of pragmatism, or military pressure? All wars lead to some destruction of parts of the world's cultural heritage, but the deliberate burning of books and the destruction of works of art seems a particularly barbarous event. It is especially outrageous when it is done in the name of the very religion that created the books and art. Yet the Jihadis who burned the Ahmed Baba Institute in Timbuktu (having already destroyed most of the Sufi shrines in the area) have almost certainly burned far more Qur'ans than Western Islamophobes have ever dreamt of doing. When the Taliban destroyed the Buddhas of Bamiyan it was equally appalling, but at least they could claim to be destroying idols; in Timbuktu, the modern Vandals destroyed some of the most precious treasures of Islamic culture. The golden age of Timbuktu was golden indeed, and the wealth of the 14th Century Emperor Mansa Musa was so vast that even the European map at left considered him one of the main points of interest in all of Africa. The news is not all bad; locals managed to preserve at least some of the thousands of ancient manuscripts, though just how bad the losses are may take some time to appreciate. But the losses are certain to be profound, however much mitigated. Minority languages in the Middle East have been a frequent theme on this blog, and Aramaic probably has more posts to its credit so far than any language other than Tamazight, the Amazigh language, which is enjoying a renaissance in the Maghreb. Aramaic is not, and since most Aramaic speakers today are Christians (though there are Jews, Mandaeans, and a few Muslims even), it is facing the erosion Christianity in the Middle East is facing across the board; since the two countries with the bulk of Aramaic speakers are Syria and Iraq, the decline is accelerating. I have posted before on a lot of Aramaic issues and have discussed its two major surviving varieties: spoken Eastern Neo-Aramaic, mostly in Iraq with pockets in Turkey and Iran, and spoken Western Neo-Aramaic, in three villages in Syria (one of them Muslim!). Of course, the spoilsport US is saying they can't confirm the monkey's flight and if it's true it may have violated a UN Resolution, but that's predictable sour grapes. It's a great step upward from Iran's previous launch of a rat, two turtles, and some worms in 2010. (A 2011 monkey launch failed, apparently to the detriment of the monkey in question.) A rat, two turtles and some worms are hardly a threat to Iran's neighbors, but think about this: monkeys throw poop. At least for now, I'm not panicking about the monkey gap. 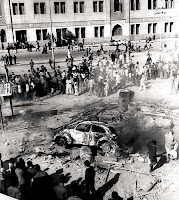 Earlier today I compared the current disorders in Egypt not only to January 2011 but also to the violence of January 1952, which reached its apogee in "Black Saturday," most famous for the destruction by the mobs of the iconic British colonial Shepheard's Hotel. I can only hope that help comes. UPDATE: Special Forces are said to be arriving. Let's hope there are no injuries. The last thing Egypt needs is another blow to its tourist industry. In my earlier post, I quoted Steve Negus' insightful piece at The Arabist on the present situation in Egypt. Here are several other useful takes on the current problems. Khaled ElGindy on "The Failure of Egyptian Politics," at Tahrir Squared. All sides are responsible for the current mess. Charles Holmes, "The Revolution Continues," at Foreign Policy. The ongoing dismantling of the Nasserist state. Amr Adly, "The Opposition's Lost Bet on the Economic Crisis," Neither side seems to be able to address the worsening economic situation. at Egypt Independent. Steven A. Cook, "Wanting Egypt to Fail," at his Council on Foreign Relations Blog. On critics of US policy towards Morsi. 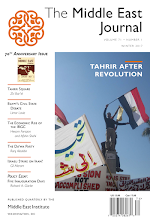 Sarah Carr, "Back to the Squares, without the Brothers," at Egypt Independent. On the anniversary. And if you haven't already seen Yasmine El Rashidi's "Egypt: The Rule of the Brotherhood" in The New York Review of Books, you should take a look at it. Bassem Sabry for Al-Monitor: "15 Things Egypt Must Do to Get Back from the Btink." The violence that has shaken Egypt for the past several days is, in part, provoked by the ongoing polarization of society and inability of any of the parties to find a way to consensus; and in part by the anniversary of the events of two years ago, the early days of the Revolution. The protests began on January 25, and January 28 was the bloodiest day. Everyone recognizes the echo of those days. But let me suggest that there is another specter haunting the events in Egypt today: the specter of another January: 1952. Saturday was the 61st anniversary of "Black Saturday" and the widespread burning of downtown Cairo. Though the British are long gone, there are echoes of Black Saturday still in the air: armed partisan groups, including the Muslim Brotherhood, an ineffective executive, a demoralized police, and, perhaps, an Army waiting in the wings. The parallels are not exact; history doesn't really repeat itself (but, as Mark Twain allegedly said, sometimes it rhymes). The various parties in Egypt increasingly see events through highly polarized lenses: the National Salvation Front rejects Morsi's offer of talks, suggesting they would not be productive, thus further undermining Morsi's legitimacy; but however ill-advised his policies may be, he did in the election, and his partisans continue with their "we won, so we don't need to listen to anyone else" approach. Both sides exclude the middle, exclude compromise, and in so doing probably exclude the views of most Egyptians. This piece by Steve Negus at The Arabist offers, I think, one of the best assessments I've seen: this is not a new dictatorship with the Muslim Brotherhood in the place of Mubarak; it's rather a fragmented state with no one clearly in firm control. The reason I bring up the specter of January 1952 is because the events in Ismailia and Black Saturday led directly and inexorably to the military coup of July of that year, and the beginning of six decades of authoritarianism. I know that some liberals in Egypt are talking almost wistfully about a possible army intervention. Have they forgotten how recently they sent the Army back to its barracks? Have they forgotten the old rule that if you bring in the Praetorian Guard to get rid of a rival, you will have a lot harder time getting rid of the Praetorians than you did the rival? I'll have more to say about events in Egypt soon, but in evoking the ghosts of January 2011, all sides would do well to remember the fires of January 1952. Four years ago yesterday, January 27, 2009, this blog began with a single placeholder post; four years ago today, I began regular blogging. I had posted 3415 posts as of Friday, with posts every day except for (most) weekends, holidays, and a few days in 2010 when I was hospitalized with a broken hip and the painkillers made me too incoherent (even more so than usual, at least) to blog. Let me thank my regular readers. In that first post I noted that the blog would eventually move from the Blogger platform to the main MEI website. Four years (and a couple of MEI webmasters) later, let me say that again; only this, time, I believe we're really going to do it. Don't worry; nothing essential will change. The President prepared to depart. But I said to him, "You cannot go all this way to North Africa without seeing Marrakech. Let us spend two days there. I must be with you when you see the sunset on the snows of the Atlas Mountains." I worked on Harry Hopkins also in this sense. It happened there was a most delightful villa, of which I knew nothing, at Marrakech which the American Vice-Consul, Mr. Kenneth Pendar, had been lent by an American lady, Mrs. Taylor. This villa would accommodate the President and me, and there was plenty of outside room for our entourages. So it was decided that we should all go to Marrakech. Churchill writes as if it was spontaneous but since the villa had been arranged and US troops lined the road for 150 miles, one presumes some pre-planning. Roosevelt and I drove together the one hundred and fifty miles across the desert — it seemed to me to be beginning to get greener — and reached the famous oasis. My description of Marrakech was — "the Paris of the Sahara," where all the caravans had come from Central Africa for centuries to be heavily taxed en route by the tribes in the mountains and afterwards swindled in the Marrakech markets, receiving the return, which they greatly valued, of the gay life [not what it means today —MCD] of the city, including fortune-tellers, snake-charmers, masses of food and drink, and on the whole the largest and most elaborately organised brothels [exactly what it means today —MCD] in the African continent. All these institutions were of long and ancient repute. It was agreed between us that I should provide the luncheon, and Tommy was accordingly charged with the task. The President and I drove together all the way, five hours, and talked a great deal of shop, but also touched on lighter matters. Many thousand American troops were posted along the road to protect us from any danger, and aeroplanes circled ceaselessly overhead . 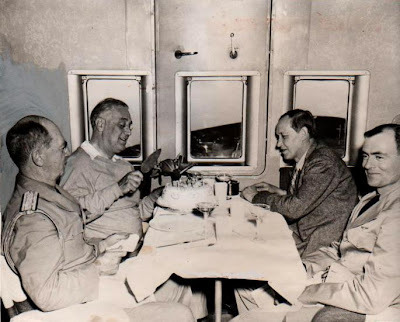 . .
As soon as the press conference was over, the two were off to Marrakesh with Hopkins and Harriman, the Prime Minister's son Randolph, Hopkins' son Robert, Admiral [Ross T.] McIntire [Roosevelt's personal physician] and an entourage of aides. It was a four-hour drive of 150 miles through the desert, the dusty road lined with American soldiers standing at attention while fighter planes swept overhead. The British had prepared a picnic lunch of hard-boiled eggs, sandwiches and mince pies to eat along the way. At 1.15 we drove to Marrakesh — picnic lunch on the way. Everyone tired but relaxed. As the British had fixed up the lunch we had plenty of wine and Scotch. In the evening we arrived at the villa, where we were very hospitably and suitably entertained by Mr. Pendar. I took the President up the tower of the villa. He was carried in a chair, and sat enjoying a wonderful sunset on the snows of the Atlas. [See the photo at top.] We had a very jolly dinner, about fifteen or sixteen, and we all sang songs. I sang, and the President joined in the choruses, and at one moment was about to try a solo. However, someone interrupted and I never heard this. We were put up at the villa of the late Moses Taylor — very pleasant. Our host was a young archaeologist named Pendar (Louise had once rented his flat in Paris) — he was one of our secret agents in N. Africa prior to the landings. Averell [Harriman], Randolph [Churchill], Robert [Hopkins, Harry’s son] and I went to visit a big fair — storytellers — dancers — snake-charmers — and 15,000 natives. Very colorful. The great trading market was near — but nothing much to sell — tho thousands ever milling thru. Dinner was good — army style — company aglow — much banter — Churchill at his best. At dinner that evening in the extraordinarily beautiful Moorish house of Mrs. Moses Taylor, then occupied by Kenneth Pendar, one of [Robert] Murphy's special agents, there were speeches, songs and toasts. Pendar took the head of the table, seating Roosevelt on his right and Churchill on his left. Harriman sat beside Roosevelt, and Hopkins next to Churchill. It was the President's habit to shift gears conversationally when he preferred not to discuss weighty matters. This time he expounded to Pendar and Harriman his views about independence for Morocco on the Philippine pattern. He talked of compulsory education, of fighting disease through immunization and of birth control. "Occasionally," Harriman noted, "the P.M. interjected a pessimistic-and realistic-note. He doesn't like the new ideas but accepts them as inevitable." Here again, as in their disagreements over India, Roosevelt and Churchill did not march to the same drumbeat. The Prime Minister made no secret of his determination to preserve the British Empire, although he knew that would be difficult. Roosevelt enjoyed thinking aloud on the tremendous changes he saw ahead-the end of colonial empires and the rise of newly independent nations across the sweep of Africa and Asia. "I felt his objectives were right," Harriman said. "I think he had a belief that his prestige, both personally and as President of the United States, was so great that he could influence the trend. He recognized the rise of nationalism among the colonial peoples. He also recognized that Churchill was pretty much a nineteenth century colonialist. So he said some of these things partly to jar Churchill but also from a fundamental belief that the old order could not last. All this was surely in Churchill's mind when he later said that he had not become Prime Minister to preside over the liquidation of the British Empire." Throughout this, their final evening together, Churchill kept looking for an opportunity to talk privately with Roosevelt. But the seating arrangement, to Churchill's great annoyance, made a tete-a-tete impossible. "Roosevelt rather liked the idea," Harriman recalled, "that he did not have to go through with this talk. He always enjoyed other people's discomfort. I think it is fair to say that it never bothered him very much when other people were unhappy." 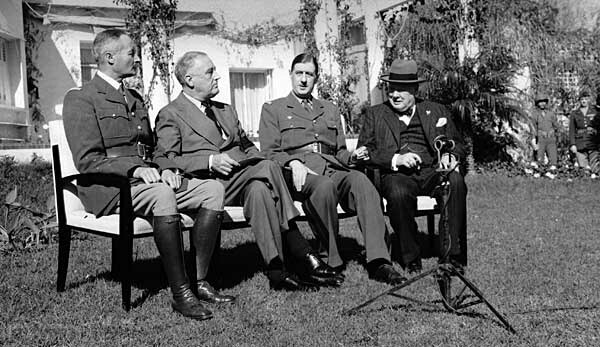 Harriman had earlier hinted that Churchill wanted to discuss further the "unconditional surrender" term decided at Casablanca. Pendar, the American Vice-Consul and an archaeologist as well as one of Robert Murphy's agents in Vichy North Africa before the Torch landings, was living in the Villa Taylor, owned by the widow of Moses Taylor of Rhode Island. Legend has it that when Mrs. Taylor, a staunch Republican, learned FDR had stayed in her villa, she resolved never to stay there again. My illustrious colleague was to depart just after dawn on the 25th for his long flight by Lagos and Dakar and so across to Brazil and then up to Washington. We had parted the night before, but he came round in the morning on the way to the aeroplane to say another good-bye. I was in bed, but would not hear of letting him go to the airfield alone, so I jumped up and put on my zip [often referred to as his "siren suit'], and nothing else except slippers, and in this informal garb I drove with him to the airfield, and went on the plane and saw him comfortably settled down, greatly admiring his courage under all his physical disabilities and feeling very anxious about the hazards he had to undertake. These aeroplane journeys had to be taken as a matter of course during the war. None the less I always regarded them as dangerous excursions. However all was well. I then returned to the Villa Taylor, where I spent another two days in correspondence with the War Cabinet about my future movements, and painting from the tower the only picture I ever attempted during the war. The trip had occupied the afternoon of January 24 through the morning of January 25, 70 years ago. Winston S. Churchill, The Hinge of Fate,(Vol. IV of The Second World War, 1950), US Edition, pp. 694-695. W. Averell Harriman and Elie Abel, Special Envoy to Hitler and Stalin, 1941-1946, (1975), pp. 191-192. Robert E. Sherwood, Roosevelt and Hopkins: An Intimate History (based on Harry Hopkins' papers), (1948), p. 694. January 25 (today) marks the second anniversary of the beginning of the Egyptian Revolution, and celebrated as a holiday by the current regime and its opponents as well. Many Westerners may not be aware o the fact that prior to 2011, January 25 was already a national holiday in Egypt: Police Day. The protesters certainly thought that a holiday would make more demonstrators available, but also sought to capitalize on the irony that a day originally intended to honor Egypt's police as patriots in the fight to end British occupation, at a time when Egypt's police had come to be seen as oppressors instead of liberators. Egyptian Police Day commemorates a battle between the Egyptian police and the British Army at Ismailia in the Canal Zone on January 25, 1952. There's a video down below you shouldn't miss. The Anglo-Egyptian Treaty of 1936 had provided for British withdrawal of its troops from Egypt, except for bases in the Suez Canal Zone for the protection of the Canal, but with the outbreak of the Second World War, Britain had invoked a clause allowing it to reoccupy Egypt. After the war British troops did withdraw to the Canal Zone, but kept force levels well above the 10,000 troops allowed in the treaty. After the Wafd Party, Britain's traditional nationalist rivals, won the 1950 elections, the Egyptian government in October 1951 unilaterally abrogated the treaty and demanded that Britain negotiate for its withdrawal. The Cold War was in full swing and Britain (and behind it the US) were already engaged in a struggle with Iranian Prime Minister Mossadeq over Iranian oil, and now faced a challenge to the Suez Canal. The Wafd, and its other traditional rival the King, were both losing influence in Egypt to growing social and economic dissatisfaction and the growth of movements with their own disciplined and sometimes armed militias, including the Muslim Brotherhood, Communists, and others. The Egyptian government decided to sanction the creation of "Liberation" squads, recruited from vlunteers (many from the Brotherhood), who began a guerrilla war against the British in the Canal Zone. The British responded with proactive moves against the "terrorists," and on January 21 entered Egyptian quarters of Ismailia seeking to uproot the Liberation squads. After coming into conflict with Egyptian police, on the 25 the Lancashire Fusiliers surrounded the Ismailia police headquarters. Oh, did I mention that January 25, 1952 was a Friday? The next day, January 26, Cairo went up in flames in what is still known as Black Saturday, which I wrote about three years ago. But the day the police fought the British Army in Ismailia became Police Day, until it also became the new Revolution Day. Even a casual tourist surely notices the profound contrast between Tel Aviv and Jerusalem, and the more one gets to know each city the sharper the contrast appears. The way folks dress on the beaches of Tel Aviv and the streets of Mea Shearim in Jerusalem are at opposite poles of just about everything. If someone approaches you on the street in Jerusalem there's a fair chance they're proselytizing (for which religion depends on the part of town); in at least certain parts of Tel Aviv (the hotel and nightclub districts for example), it's likelier they're offering some form of negotiable companionship for the evening. There are things I like about each city, although as a historian, Jerusalem to me is an irreplaceable monument while Tel Aviv is almost American (with a touch of a European capital) and barely over a century old in a region of ageless cities. So it's hardly surprising that the two cities don't vote alike. Okay, we've been stuck in the last couple of centuries most of the week, so let's talk a bit about the eighth century AD, shall we? It was carried in a larger leather book cover, stiffened with papyrus, that had been manufactured for some other book, and this object itself evokes the humid heat of the Nile Delta, where warble flies buzzed around the ears of Coptic cattle. Emphasising the extraordinary character of the book’s very survival is the fact that in many cases, it was the inky letters themselves on the pages that preserved the vellum, whereas the rest of the pages were destroyed. Finally, the book and its cover were thrust down into a bog pool, together with a pig-skin bag and covered with a piece of white-haired calf hide. Leaving aside how archaeologists determined what religion the "Coptic cattle" were, the key element here seems to be that this Irish psalter has a leather book cover stiffened with papyrus. Papyrus is not, of course, growing on the banks of the Shannon or the Liffey, to the best of my knowledge. So it's one more piece of circumstantial evidence of the links between the two churches. Actually I think this the same artifact referred to in this 2010 post, but it's now on public display. There may be many ways to explain the papyrus, but there's sufficient other evidence of links between the two countries, probably much earlier than the 8th century. 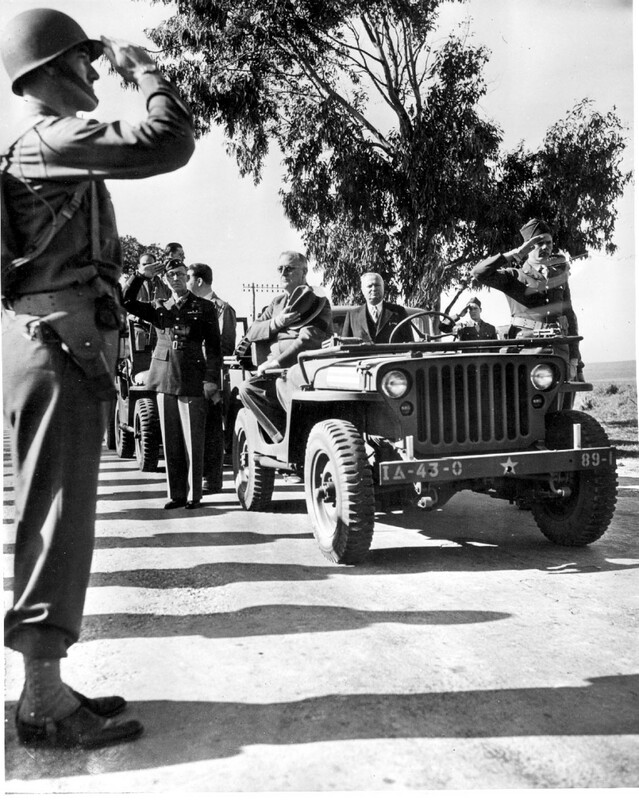 A number of times this month I've posted about the 1943 Casablanca Conference which took place 70 years ago. Today marks the day it ended. 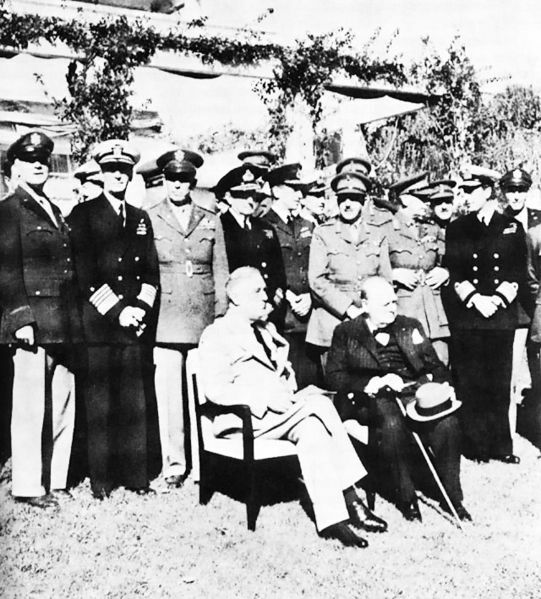 The conference had accomplished a number of things: allowed for extensive US-British military planning, including the decision to invade Sicily when the war in North Africa was over; issued a declaration that the Allies were fighting for the "unconditional surrender" of the Axis (which became controversial); and brought about a working (barely) relationship between the two rival French generals, each with huge Gallic egos, Henri Giraud and Charles de Gaulle. 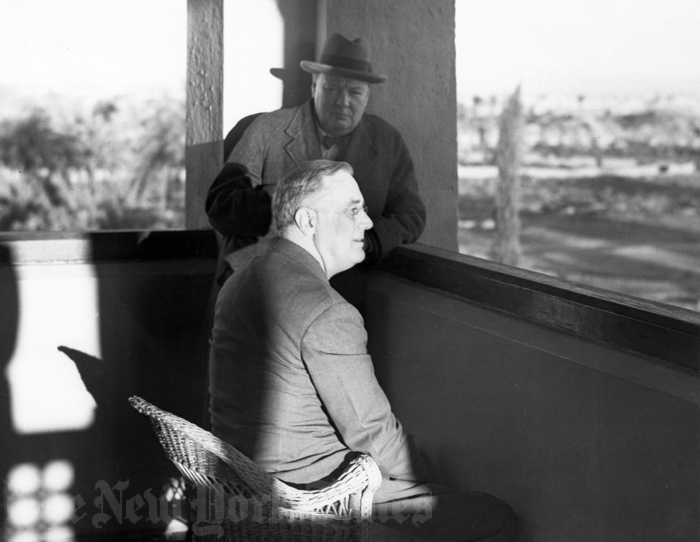 After the end of the news conference/photo op, Churchill, who loved Marrakesh and frequently went there to paint, took Roosevelt off to the Moroccan desert city for an overnight jaunt to show his American colleague its beauty. But that's a tale in its own right, and will be one of my posts tomorrow. Neve Gordon at LRB Blog on "Five Ways of Looking at the Knesset." Several graphic depictions showing that on many issues the new Knesset is not as divided as it's being portrayed. 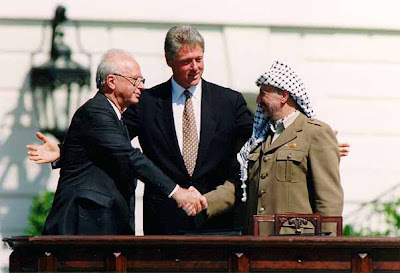 Zvika Krieger at The Atlantic on "The Three Men Who Could Save Israel's Center-Left." He argues that neither Yair Lapid nor Shelly Yachimovich are credible Prime Ministers, but by the next election (and this will not be a long-lived government), three ex-security officials will be eligible to run for office: ex-Mossad Chief Meir Dagan, ex-Shin Bet Chief Yuval Diskin, and ex-IDF Chief Gabi Ashkenazi. Raja Shehadeh at The Guardian: "Israeli Election Means Little to Most Palestinians —With Good Reason." As its name suggests (it means “there is a future” in Hebrew), Lapid’s party is, literally, the personification of vapid centrism. The only glue that holds it together is the fact that its future parliamentarians were picked at the sole discretion of their founder and chairman. Lapid himself, despite running for office (tacitly and explicitly) for almost two years now, has not distinguished himself as a clear voice on public policy. On the two most important issues facing the country – relations with the Palestinians and economic policy – Lapid has evaded taking any tough stances. Indeed, he is famously self-contradictory and vague. He is slightly more strident regarding relations between secular and religious Jews, but even here his solutions are usually mushy and ideally suited for politically convenient foot-dragging and can-kicking. Greetings and best wishes to my Muslim readers on the occasion of the Prophet's birthday, which begins at sundown today. I'll have more later on the Israeli results, though the final allocation of Knesset seats won't be certain until the soldiers' votes are counted, perhaps not until tomorrow. Meanwhile, there's another election in the neighborhood today, in Jordan. The fact that the Islamic Action Front (the Muslim Brotherhood's Jordanian political wing) is boycotting makes the election controversial. For background until we have results, see this Foreign Policy piece by Curtis Ryan, "What to Expect From Jordan's Elections." Exit polling (not, at this time, official results) suggests that while Netanyahu's Likud is still the largest party in the Knesset and thus he will likely form the next government, the right has been much weakened. Likud is forecast to win only 31 seats in the 120-seat Knesset, down from 42 in the outgoing Knesset. 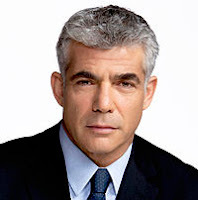 Yair Lapid's new Yesh Atid (There is a Future) Party is forecast to be the second largest party with 18 or 19 seats. More importantly, if the exit polls hold up, the right wing and Orthodox religous parties will command, at best, 61 seats, with the center and left holding 59: a nearly split Knesset. Coalition building is never that simple in Israel, and a seat or two difference in the final results might even make it possible for the left to block Netanyahu or limit him to a weak, unstable coalition. His own Likud Beitenu now includes the rabid secularists of the former Yisrael Beitenu, who favor policies anathema to the religious parties. Lapid looks to be the kingmaker here. He can join Likud in a strong center-right coalition or join the left in blocking that. His party may have a dozen fewer seats than Netanhyahu's but he is the real winner in this election since both sides will be wooing him, and he's likely to drive a hard bargain. His party favors military service for all Israelis, ending the exemption for Yeshiva students, which will not sit well with religious coalition partners. Binyamin Netanyahu issued a late call to Likud voters to get out and vote after it became clear that there are very high turnouts in much of Israel, but lower than expected in some Likud strongholds. There are also early indications that Yair Lapid's new Yesh Atid Party is doing very well. None of this is reason to expect an upset; by almost all estimates, Likud will still be he biggest party. A resurgent center might, however, persuade Netanyahu to form a center-right coalition rather than a hard-right one. But I won't speculate further here; we'll soon know the results. I haven't been writing about the Israeli elections, and in fact coverage in the Western media has been relatively light. The reason is that few can conjure up a scenario under which anyone other than Bibi Netanyahu will form the next government. But in fact the prospects are that these elections will be among the most transformative in the history of the state. The government formed four years ago was widely described at the time as the most right-wing in Israeli history. Unless the polls and prognosticators are dramatically wrong, dovish Israelis may look back on that government wistfully. Four years ago I had just begun this blog, and my coverage of the elections was one of my first major themes. Given the tenor of the government which emerged, it is easy to forget that the party that won the most Knesset seats in 2009 was the centrist Kadima, led by Tzipi Livni. She could not form a coalition so Likud did instead, joined by the hard-right Yisrael Beitenu of Avigdor Lieberman, and Labor under Ehud Barak as a moderating force. The fact is that even Likud's own leadership is to the right of where it was; the moderate wing of the party was mostly swept away in the primaries. So once (barring huge surprises) Netanyahu starts to form a government the issue will be whether he goes exclusively to the hard right and religious parties for a coalition, or whether he tries to include the centrists. His own party is likely to be pressuring him in the former direction. The debate over whether there is still a future for a two-state solution may be riding on these elections, and the auguries are not good. More as the returns come in. The blog "Exploring Oman's Linguistic Treasures" (yes,there is one) has a piece some of you may find interesting: "The Google Translate Plague." I started my post with a rather strange appreciation of the skills needed to plagiarise. The reason is because a lot of students do not even bother about all skills mentioned. So if they don't use those skills and they don't produce their authentic work, then what do they do? They simply go to this tool which was created for great purposes, none of which I am sure is to help students cheat: www.translate.google.com . They simply paste their Arabic text in there and get a ready made piece of writing in English. The messily-translated chunks of language submitted can be outrageous but hilarious at the same time. And I say it's messy because as a machine translator it translates things literally in terms of meaning and discards any grammatical rules of the second language most of the time; it simply follows the word order of the translated language. The effect, my respected readers, can be speechless, as you realise. One student for instance, typed all the Arabic he wanted to express and clicked to translate it into English. Apparently the student wanted to translate the word 'feather' (singular) to English. Note that the Arabic word for feather and badminton (the sport) is the same. The student ended up submitting something that is along the lines of 'the badminton of the bird'...which is interesting if you think about it; but maybe in a fictional text rather than non-fictional prose? Today's a US holiday (Martin Luther King Day combined with the Presidential inauguration) so posting may be light but with Israel's elections tomorrow and Jordan's on Wednesday, it's going to be a busy week. First off today I wanted to point you to several interesting takes on the events in Algeria and Mali that provide useful perspectives that differ a bit from the Western media's received wisdom. Natalya Vince, "In Amenas – a history of silence, not a history of violence" argues that much of the commentary on the Algerian response has focused on Algeria's supposed violent heritage, compressing modern Algerian history into the war of independence and the troubles of the 1990s and ignoring everything in between. A useful antidote to much superficial commentary. The Mauritanian blogger who blogs at Dekhnistan offers "A Disaster 50 Years in the Making," arguing that the roots of the situation in Mali lie not just in the Libyan civil war or the rise of Al-Qa‘ida in the Islamic Maghreb (AQIM), but in the years before French West Africa achieved independence, when nothing was done to alter colonial boundaries that combined Tuareg and Amazigh north with sub-Saharan south in such countries as Mauritania, Niger, Mali and Chad. While, farther east, we welcome the separation of Sudan and South Sudan, the specter of Al-Qa‘ida has become the primary focus in Mali. Related to the above, an article in Libération reminds us that not all of the northern rebels are Islamists, and that the Tuareg separatist group that started the whole affair the MNLA, are still in the mix: "Le Nord-Mali entre Touaregs et jihadistes" (in French). "How the French Air War in Mali Really Went Down" offers what appears to be considerable detail about the French (and other Western) operations over Mali in the current campaign. 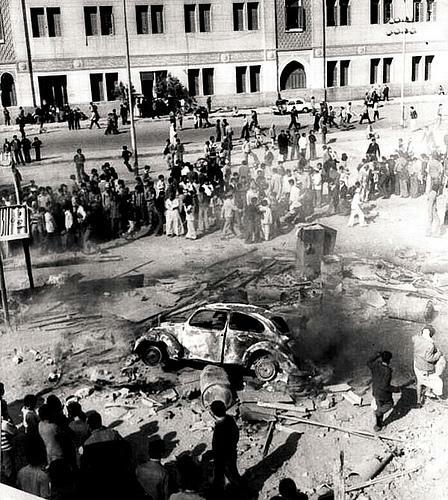 As Ahram Online notes, this weekend marks 36 years since the Cairo bread riots of 1977. Beginning spontaneously when the government lifted subsidies on flour and other necessities, they spread throughout the country until put down by the military. They were an early echo of the dissidence that would eventually bring down Mubarak (who was then Vice President under Anwar Sadat). I wasn't in Egypt during the bread riots, but arrived for a year's stay a few months later, and heard stories of how intense they had been; there were apparently moments when Anwar Sadat contemplated leaving the country. You wouldn't know that from this 1977 CBS 60 Minutes report in which Sadat seems confident of his own popularity. (Egyptian Presidents in denial is not a new thing.) Sorry, but you have to watch an ad before the clip. This has no direct Mideast connection but since various posts on hieroglyphics, Coptic, Aramaic and other ancient tongues make me suspect I have some readers with an interest in antiquity, who might want to polish up their rusty Latin, I'll just note that Pope Benedict XVI, who's up to now been tweeting in eight languages, is going to start tweeting in Latin. His Latin tweets will be found at Pontifex_ln. You probably have heard how King ‘Abdullah of Saudi Arabia recently named 30 women to the Shura Council, the country's appointed advisory council, named by the King to advise the King.It cannot legislate and is unelected. There are still now women in the Cabinet, and the 30 women in the 150-seat Council will be seated separately and enter by a separate door. And they still can't drive to the meetings. In other words, while an encouraging sign of change in the Kingdom, the move did not exactly turn the country into an egalitarian utopia. In an unauthorized but un-policed protest at the royal palace, a video of which is now circulating on YouTube, religious groups condemned ''the dangerous changes taking place in the country''. They demanded a meeting with palace officials to ''make them change their minds'', saying the female nominations ''are not representative of society'' and calling for similar parliamentary quotas for religious figures. I've been holding off on posting about the Algerian raid to free the hostages in the Sahara because reports have been so confusing and conflicted. It does seem that there are a large number of dead hostages, most apparently Algerian workers; it's also known that the hostages represented perhaps a dozen or so foreign nationalities. Though the hostage-takers claimed to be retaliating for French intervention in Mali, kidnapping for ransom has a long history in Algeria, and while there's little question that this incident is a symptom of the worsening security situation in the Sahara generally. Algeria is reportedly saying the perpetrators entered the country from Libya. I'll say more if we learn more. Two French-language sites are live-updating: Le Monde here, and Le Point here, and seem to be faster than the English-language sites, if you read French. More to come. In case you missed it, I wanted to call to your attention Yezid Sayigh's piece at Al-Monitor (originally for the Carnegie Middle East Center in Beirut), "Morsi and Egypt's Military." The exact role of the Army vis-a-vis Morsi has been something of a puzzle since the wave of retirements last August, and Sayigh sees that arrangement, and the powers accorded the military on the new constitution, as solidifying the autonomous power and perquisites of the Armed Forces, even to a greater degree than in the Sadat and Mubarak years. But he does not assume, as some have tended to do, that the Army does not pose a potential challenge to Morsi's consolidation of power. Not everyone will agree with Sayigh's read on this, but it's an important contribution that sheds light on one of the least transparent, but most powerful, players in the Egyptian arena. The recent change in governors in Saudi Arabia's restive Eastern Province is drawing considerable attention, given the relatively rare reshuffles among senior figures in the Royal Family. The replacement of Muhammad bin Fahd, who had been governor since 1985, and the appointment of Saud bin Nayef to replace him, suggests the Kingdom is concerned about its dissident Shi‘ite minority. A leading expert on the subject, Toby Matthiesen, has a piece at Foreign Policy worthy of your attention, "Saudi Royal Family Politics and the Arab Spring." He also notes the rise of the sons of the late Crown Prince Nayef, since Muhammad bin Nayef, long the country's anti-terrorism chief, is now in his father's old job of Interior Minister, while Saud bin Nayef know controls the Eastern Province. A huge jubilant crowd poured into the main football stadium in Tripoli last night, Saturday, for the first celebration in more than 40 years of the Amazigh New Year, which started today. 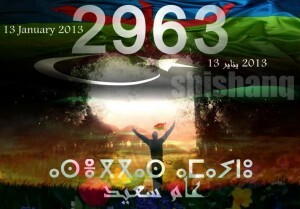 It is the year 2963 in the Amazigh calendar. From around 5pm, several thousand people from all Amazigh and non-Amazigh towns and places across the country descended on the stadium in Tripoli’s Sport’s City for a concert that it was — so far — one of its kind. The crowd filled the entire stadium and seats were eagerly sought by them families that had come along for the event. There were far more people than had been expected. “It means everything to us ” said Salam Al-Arussi, a teacher and Amazigh rights activist. “It has always been a dream and I never thought I would live to witness such day, I am so overwhelmed with happiness — and frustration that I didn’t do what youngsters did and overthrow the tyrant” said Ahmed Abodaya, a 47-year-old engineer attending the event. I explained here last year how the traditional North African Berber or agricultural calendar begins its new year on the old Julian calendar New Year, now January 14 (though many Algerian Amazigh observe on January 12). In that blog post I also noted that the dating system is a modern "invention of tradition," choosing to date the calendar from the Pharaoh Shoshenq I, considered by Berber nationalists as the "first Amazigh in history." So this is the year 2963. Here are stories on the celebrations in Morocco and on how Algeria banned a march by a Kabyle separatist movement. though clearly the real story is the celebration in Tripoli, where under Qadhafi the regime banned Amazigh language, names, and cultural elements, even denying the very existence of a separate culture. Also see a BBC account here with a video (which I can't embed here) on the concert and the first Amazigh-language magazine in Libya. I'm Trying to Avoid the Obvious Headline Metaphor About Egypt's Government Being a "Train Wreck"
But someone's going to use that headline soon, I'm sure. Egypt's latest train disaster, coming only two months after its last one, is drawing a lot of criticism of the government's inability to do anything about these sorts of preventable disasters. Prime Minister Qandil, visiting the site of the wreck, had to be rushed to safety when crowds started throwing things. The train, carrying Central Security Forces recruits, derailed after a car became uncoupled and crashed into a freight train, leaving 19 dead and over 100 injured. In November, another train hit a school bus at a grade crossing which had not been closed, killing 51 schoolchildren. Ahram Online provides a helpful timeline of fatal train crashes since 1992; just since last July there have been four (excluding this latest), but involving six trains, since two of those were collisions. That's five wrecks involving eight trains in a little over six months, and those are just the ones with fatalities. There are reports that the recruits aboard thought the train was being operated improperly but were afraid to complain because of military discipline. Zeinobia is reporting there were 1200 conscripts on the train, with six seated in each space designed for two, and with neither lights nor toilets. She also says the Prime Minister initially sent condolences to the Defense Ministry, though these were Interior Ministry conscripts. Whatever the reasons in this case, there is a long history of overcrowded and overloaded trains, operated at excessive speeds on deteriorating trackbeds, collisions at speed, ungated crossings, and the like. There are regulations of course, but they are poorly enforced (if at all). Apparently recognizing the growing public anger, the Muslim Brotherhood promptly blamed Husni Mubarak. (Though Zeinobia also refers to conspiracy theories blaming the opposition.) Thirty years of neglect is certainly a factor, but all those crashes in 2012 and now this one are wearing popular patience thin. The Moroccans at the Casablanca Conference: the Sultan Dines with FDR and Churchill: Did FDR Support Moroccan Independence? In my post yesterday on the 70th anniversary of the Casablanca Conference, I said that it was "in, but not of" Morocco, and that Moroccans were excluded from the bubble in which it took place. That was not of course, 100% true: Morocco was a French Protectorate, not a colony, and its ruler was technically Sultan (later King) Mohammed V (Muhammad V). (I've posted previously about General George S. Patton's impressions of the Sultan.) Ceremonially speaking, at least, he was the host of the Conference (though not involved in the negotiations), and on January 22, President Franklin Roosevelt hosted a banquet in honor of the nominal host. (But read on: there's some evidence FDR was sending an anti-colonial message to the French by hosting the Sultan) Photos of this event seem few and far between, and this is the only one I could find, but it shows most of the key players and offers a good introduction to talking about the banquet. On the couch: Sultan Mohammed V, President Franklin D. Roosevelt, Prime Minister Winston Churchill. Back row from left: Gen. George S. Patton (US Military Commander in Morocco), Robert Murphy (US diplomatic representative in French North Africa), Harry Hopkins (Roosevelt aide and personal friend), Moroccan Crown Prince Moulay Hassan (future King Hassan II, then 13), General Charles Noguès (French Governor-General of Morocco), the Moroccan Chief of Protocol, the Moroccan Grand Vizier, Lt. Col. Elliott Roosevelt (the President's son), Roosevelt's Naval Aide Captain John L. McCrea. At dinner . . . President, Sultan, Protocol, self, Crown Prince. Elliott Roosevelt, Nogues, Hopkins, Murphy. Grand Vizier, Churchill. No wine, only orange juice and water. Churchill was very rude, the President was great, talking volubly in bad French and really doing his stuff. After dinner we had [motion] pictures and more talk . . . I rode with Sultan and Grand Vizier to house of latter. On way Sultan said, "Truly your President is a very great man and a great friend of myself and of my people. He shines by comparison with the other one. "[presumably Churchill] . . .
General Noguès, by the way, was a Vichy holdover who had vacillated so much in negotiation with the Americans that General Eisenhower reportedly referred to him as "General No-Yes." The Sultan arrived at 7:40, which caused me to put on my black tie for the first time on this trip. He had expressed a desire to see the President alone prior to Churchill's arrival at eight, and he came loaded with presents — a gold dagger for the President, and some gold bracelets for Mrs Roosevelt, and a gold tiara which looked to me like the kind the gals wear in the circus, riding on white horses. I can just see Mrs. Roosevelt when she takes a look at this. The Sultan wore white silk robes. Apparently the etiquette prohibits the drinking of liquor publicly, so we had nothing alcoholic either before, during, or after dinner. I fortified myself an hour earlier, however. Churchill had apparently just met with de Gaulle; that, combined with the absence of alcohol and tobacco (which Churchill normally considered essentials at dinner), might explain his mood, as our next quote also suggests.Though Churchill's massive six volume memoir of the war is far more extensive than other memoirs, I find no mention in it of the dinner at all. The evening of the day De Gaulle arrived in Casablanca, just before he and Roosevelt were to meet with each other for the first time, the President gave a dinner in honor of the Sultan of Morocco. This affair was entirely Roosevelt's own idea. He had not forgotten the reluctance of General Nogues to deliver his letter to the Sultan at the time of the landings, and one of the first things the President asked me to do was to arrange an intimate little dinner at his villa. The Sultan was accompanied by his eldest son, and the other guests were Nogues — who was invited as the Sultan's Foreign Minister under the French Protectorate — Churchill, Macmillan, Marshall, Patton, Hopkins, Elliott Roosevelt, and me. [Other memoirs don't mention George C. Marshall's or Macmillan's presence, nor is he in the photo. Harold Macmillan might have been left out but it's unlikely Marshall would not have been in the photo when his subordinate Patton was, nor can I find any evidence in his biographies that he attended.] In deference to the Sultan's Moslem code of behavior, no alcoholic beverages of any kind were served before, during, or after the dinner. Perhaps it was this rare abstinence which caused the British Prime Minister to be unnaturally glum throughout the evening, or perhaps he remained silent because he regarded the whole occasion as deliberately provocative. The President began the serious conversation by expressing sympathy with colonial aspirations for independence, and soon he was proposing to the Sultan that arrangements should be made after the war for American-Moroccan economic co-operation. Nogues, who had devoted his career to fortifying the French position in Morocco, could not conceal his outraged feelings. Hopkins observed that Nogues seemed to be uneasy "because he knows we may throw him out any minute." I suggested to Hopkins, "Perhaps the President’s approaches to the Sultan also aggravate Nogues’s fears about American designs on the French Empire. From the point of view of any imperialist — including De Gaulle and Churchill— the President’s conversation with the Sultan could seem subversive." With an impatient shrug, Hopkins changed the subject. The Sultan would be deposed later, not by de Gaulle. and then returned to power and be elevated to King on Moroccan independence. Though ignored by diarists at the time, Roosevelt's probing the Sultan for future post-colonial relations is characteristic of his known attitudes. 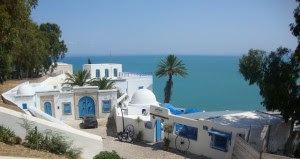 The latest apparent Salafi attack and destruction of a Sufi saint's tomb in North Africa is one I'm taking somewhat personally: nearly 20 years ago my wife and I took our honeymoon in Sidi Bou Said, the beautiful Tunisian coastal town on a promontory near Tunis, known for its white houses with blue trim, its stunning views of the Mediterranean and its popularity as an artist's colony. Sidi Bou Said takes its name from its local saint who settled there in the late 12th/early 13 century AD, became a respected local marabout, and around whose mausoleum/shrine the town grew up, Sidi Bou Said is a popular tourist destination, though most tourists probably either do not notice his tomb or would not recognize it as a saint's tomb. 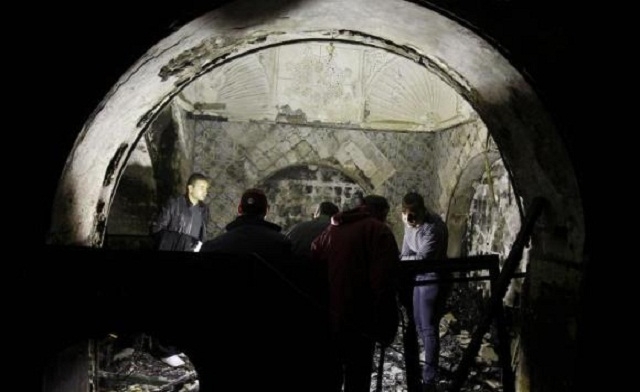 Yesterday we learned that a fire, which the authorities believe was arson, destroyed the mausoleum of Sidi Bou Said. Though no official suspects were named and officially it is being branded an attack on the nation's cultural heritage, prominent Sufi shrines across North Africa have come under attack from Salafis who consider the veneration of saints as idolatry, and the more famous the shrine, the likelier it seems to be that it will be targeted. The town, where Sufis gather annually to celebrate the saint, has lost one of its landmarks in what appears to be the latest Salafi assault on Islamic heritage. And ironically, today marks the second anniversary of President Ben Ali's departure and the success of the Tunisian Revolution. I've already foreshadowed the 70th anniversary of the Casablanca Conference in a couple of recent posts. Today marks the beginning of the Conference in the Anfa resort area on January 14, 1943. The Conference was in, but very much not of (or about), Morocco. Sultan Muhammad V was not among the participants. 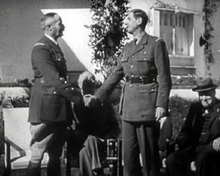 It was essentially an Anglo-American summit with a French subtext, as the Allies sought to reconcile the two hostile figures seeking to lead the French abroad: Charles de Gaulle and Henri Giraud. 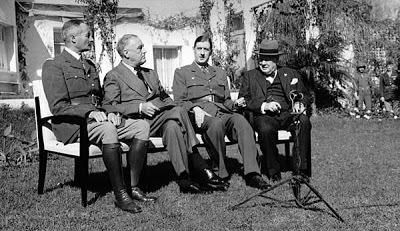 But the main purpose was to allow the Combined Chiefs of Staff of the UK and US to meet in purpose, as well as FDR and Churchill. Stalin had also been invited, but in late 1942 the Red Army had broken through at Stalingrad and surrounded the German VIth Army Group, which was now starving and cut off but ordered by Hitler to fight to the last man. Stalin felt he couldn't travel. The Conference is mainly remembered today for the US-British insistence on "unconditional surrender" by the Axis (which would cause some problems later on), and for the de Gaulle-Giraud meeting, shown in the photos at bottom, which I'll blog more about later as it occurred at the end of the Conference. It was the first Roosevelt trip abroad (excluding Canada) while in office and the first by any US President during wartime. It was also the first of the summits to be held in the Middle East (Cairo and Tehran would follow). Like them, it took place in a bubble isolated from the Moroccans all around it. On New Year's Eve, I noted how FDR had enjoyed an inside joke by showing his guests the film Casablanca, though the imminent Casablanca Conference was of course a tightly held secret, since the President, Winston Churchill, and all the US and UK Chiefs of Staff would be crossing an ocean full of German U-boats and meeting in a city that had been controlled by Vichy only weeks before. The trip itself was roundabout and difficult. Roosevelt took his train to Miami, Florida, where they met two Boeing 314 Clipper flying boats on loan from Pan Am. Roosevelt used the Dixie Clipper,which had been the first to provide regularly scheduled commercial trans-Atlantic air service in 1939. His closest advisers traveled with him, while the rest of the party boarded the sister ship, the Atlantic Clipper. On the 11th, the two planes flew to Trinidad. Admiral William Leahy, Roosevelt's personal Chief of Staff, who had been US Ambassador to Vichy and was needed for his expertise on France, stayed behind in Trinidad with a fever from influenza. The planes flew the next day to Belem, Brazil, then crossed the Atlantic to Bathurst (now Banjul) in Gambia (then a British colony). They dined aboard the USS Memphis, which was in port. From there a military C-54 flew the party to Casablanca. I sat with him, strapped him in, as the plane rose from the water — and he acted like a sixteen-year-old, for he had done no flying since he was President. Hopkins also noted that they served cocktails aboard the Clipper. 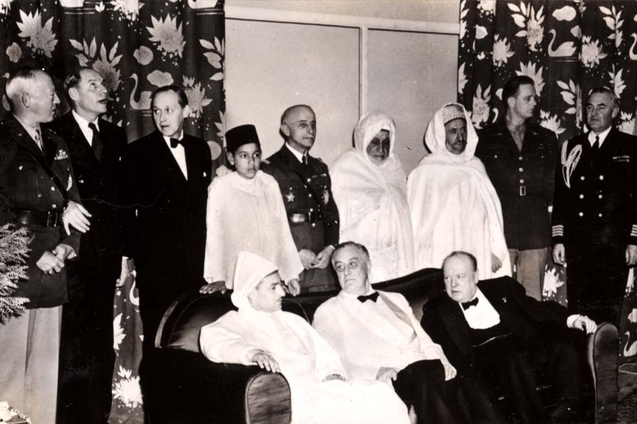 Next week, I'll discuss the anniverserary of the Casablanca Conference in greater detail.